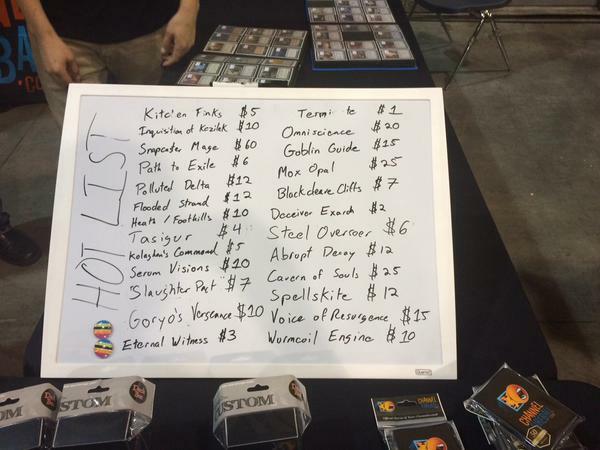 Nearly 4 months after Pro Tour: Fate Reforged and a lively Modern metagame, here we are at the doorstep of another epic battle between top Magic: The Gathering pros from across the continent as GPCharlotte puts the focus back on Modern cards just a week after the SCG Invitational and Open did the same. 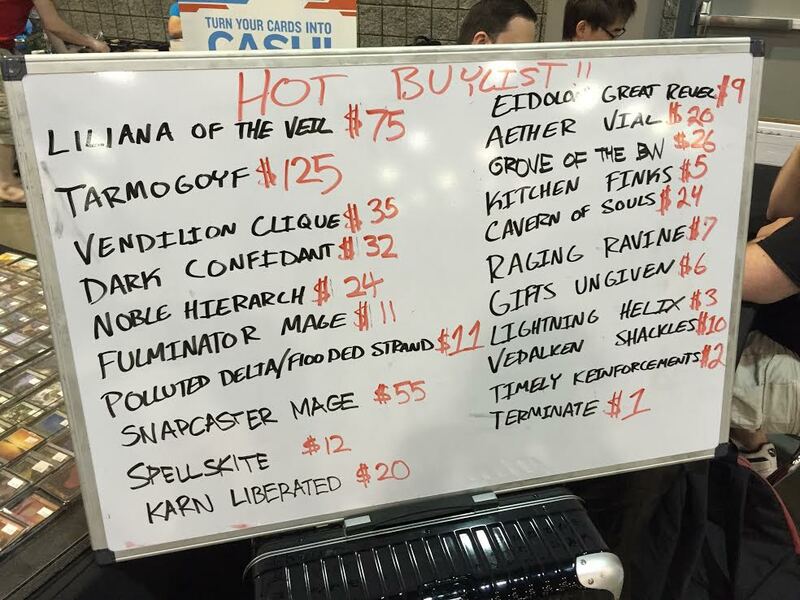 Coming out of last week, the top decks included 2 copies of Amulet Bloom, a resurgent Jund build, a fairly stock Merfolk deck, Grixis Twin and two copies of R/G Tron, with the latter taking down the tournament. For the MTG Finance community, a plethora of spikes this week on cards that weren’t included in Modern Masters 2015 may have exhausted a lot of the spike potential for the weekend. And yet, some of the reprints from MM2 have strong potential for a rebound on the back of a fresh Top 8. Sitting at a 5-year low of $40-45, Bob is in position for a strong rebound if it can find a Top 8 in the company of a Jund build or something fresh that demonstrates the power of drawing extra cards every turn. 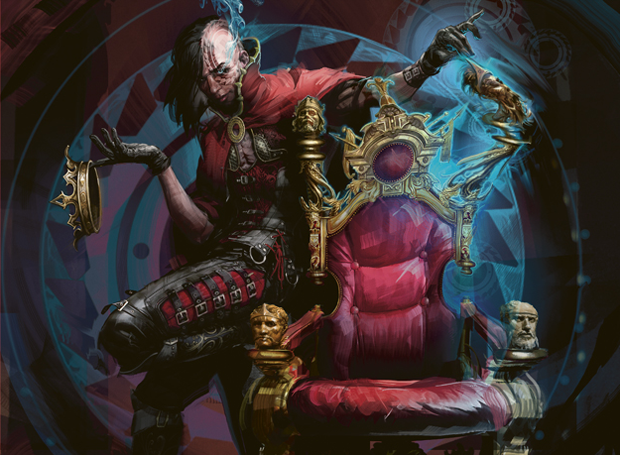 Just a year ago it would have been unthinkable that Dark Confidant would swap price points with Snapcaster Mage but here we are with this former staple struggling to find a consistent home. 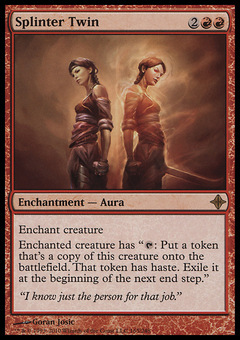 While it’s true that the card has been reprinted twice in the last three years, those printings were more more uber-mythic than true mythic given the short run nature of the sets, and I have the card on my radar to regain ground to $60 if it manages a strong finish at this tournament. From $20 to $80+ in a little over a year makes for some very nice returns for those of us that have been hoarding copies waiting for this day. As a flexible spell l retrieval unit, complete with a low and splash-able casting cost, Tiago Chan’s invitational card may still have room to grow if it can find a Top 8 via the success of a Jeskai Tempo, Grixis Twin or Grixis Control. A reprint is unlikely prior to 2017 as this card bears a strong mark as an MM3 target, so there is definitely room to run. With a 2nd place finish at Pro Tour: Fate Reforged in February and two copies in the Top 8 last week at the SCG Invi, scrutiny is now squarely on the deck that allows for some of the fastest kills in the format. Another win at this tournament could easily trigger a tactical banning, which should have owners of the deck feeling fairly nervous. Whether it’s being on display in UR Twin, RUG Twin with Tarmogoyf or the more recently debuted Grixis Twin, this format defining combo card may be safe from a banning due to it’s recent reprinting in MM 2015. As an auto 3-of or 4-of in all variants of the deck, this card has fallen 50% or so since the reprinting, but could stand to gain ground before end of summer on the back of another strong finish at this tournament. Absent a ban, I can easily see this card topping $30 before end of the year so I’ve been picking up copies. Overlooked when first spoiled, this Command may well end up being the best of the five for Modern play. With the ability to handle small creatures, key artifacts in Merfolk, Tron and Affinity, return relevant creatures or force a discard at a key moment, the versatility of modal spells is being proven out yet again. Foils have already doubled up but I suspect they have further to run should they take a trophy home. Despite a reprinting in Commander 2013, this banner uncommon often found as a 3 or 4-of in Twin variants has spiked hard this week, with a buyout driving the price from $1.50 up to $4. A good showing from one of the Twin decks could cement the new price. Aintrazi steals a surprise Game 1 victory on the back of two copies of Pyroclasm. This match puts the focus clearly on the key cards from the latest incarnation of Splinter Twin decks, including: Kolaghan’s Command, Splinter Twin, Tasigur, the Golden Fang, Thoughtseize, Snapcaster Mage and Cryptic Command. Former Top 8 Bloom player, Justin Cohen is back on camera at 3-0 with the deck he helped bring into the spotlight. Destructive Revelry in the hands of Mulen takes out the Amulet of Vigor that Cohen needed to go off, and Burn steals the match. Dickmann takes Game 1 relatively easily. A flurry of remands in Game 2 underscores the importance of this card in Modern and serves as a reminder that the recently reprinted uncommon will likely regain lost ground within the year. 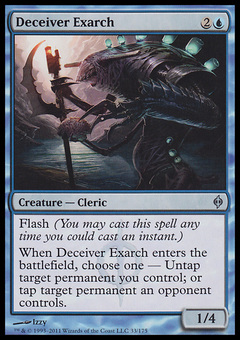 A pair of Deceiver Exarchs put away Game 2 for Runyon to even things up and reinforce the price spike on Exarch this week. Dickmann snags a last turn win off of a top decked Cryptic Command to steal the 3rd game in extra turns! Dragonlord Ojutai has been called out as a key card in a deck tech with Matt Sperling to air shortly. A couple of Jund decks are 7-0 in the hands of players like Owen Turtenwald and Andrew Boswell. Infect takes game 1 and beats a great hand from Hao-Shan to take the match. Gurmag Angler and Jace, Architect of Thought getting some camera time in Game 2. A rare appearance by Countersquall in Game 3 as Chapin picks up the pace in a plodding control mirror in danger of hitting extra turns. 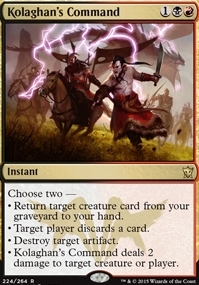 Kolaghan’s Command on display again as a key new staple in Modern. Chapin plays tight and gets the win he needs to make Day 2. Dragonlord Ojutai being put to use as a 4-of as a central pillar of the deck. Running two copies of Nameless Inversion to turn on Silumgar’s Scorn. Also running Careful Consideration, Tolaria West, Minamo, School at Water’s Edge, and Calciform Pools. Hall of Famer Ben Stark is putting a strong spotlight on Collected Company’s future in Modern, take on one of the best decks and players in the format on camera. Scavenging Ooze and Voice of Resurgance both looked great, but Dickmann goes to 8-1 moving into Day 2. Round 9 Dickmann (Temur Twin) vs Stark (Abzan Company): in a losing effort Voice and Scavenging Ooze looked very good. Can they see price growth?? I believe both of those cards will see plenty of growth in the next couple months. Voice has already risen little by little daily for the last week. Do you think that Snapecaster still has room to grow in the future? It seems like it has already reached a spike here. 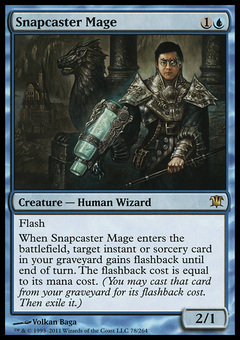 Vince in my opinion yes Snapcaster has room to grow. 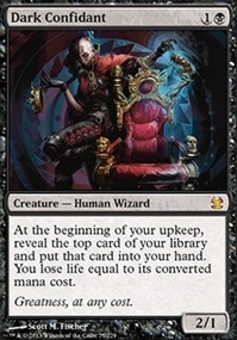 I personally am a little worried that Wizards will do something silly and reprint him earlier than expect as his price gets out of control…but he’s looked amazing on camera during GP Charlotte. James, I’ll look for your day 2 page, but Scavenging Ooze is looking good again to start the day. Your thoughts on a price spike?? Thanks for your input Spencer! I own a few copies myself and was wondering what do to with these, as demand recently got way higher among my friends!